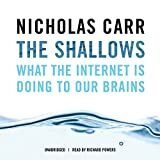 I listened to Nicholas Carr's The Shallows on unabridged audiobook, which forced me to listen to it from start to finish, although I didn't get to see the 27 pages of notes, the 2 pages of acknowledgements, and the 18 pages of index. I suspect that had I been reviewing the print version, I would have browsed through the book and skipped the long repetitive passages. Although the book took only 9 hours to listen to, it felt much longer. It is full of anecdotes fused with discussion of other people's blog posts and scientific data. Carr's message is straightforward: the Internet is having a profound effect on how we process information, making us more distractable and less able to think deeply. He has some evidence for his claims, in the form of recent studies showing how people's performances on tests become worse when they use the Internet or computers to learn. However, the basic idea that we are becoming shallower is much harder to test experimentally, because it is more difficult to formulate the difference between shallow and deep thinking in operational terms. He does provide a great deal of anecdotal evidence that people find it more difficult to think about issues in a sustained way about important issues because they have become immersed in the Internet, but it does not amount to a strong case. Even though this is a short book -- the main body of text is only about 200 pages, with quite large print -- it meanders from subject to subject, putting the whole issue in historical and cultural context. Some of these detours are indeed interesting: the tale of Nietzsche's typewriter was new to me, and is a nice example of how new technology can be unhelpful. Overall though the circuitous routes to the main arguments try the listener's patience. Nevertheless, Carr's concern about the Internet is a perfectly reasonable one, and it may well be that there are significant costs associated with the advantages of having information so easily accessible to us. Listening to the book made me more aware of my own reduced attention span and my need to check email every few minutes. I already knew that I often get more reading done on long plane and train journeys when I don't have access to a computer than I do at home, and listening to this book made me consider taking a sustained break from Internet access. Furthermore, the print version of the book might well be very useful for people wanting to follow up the information in the book and to examine the original scientific papers. It could be a useful resource for someone putting together an undergraduate lecture on the effects of the Internet. What I'm recommending then is that you don't read this book, but rather skim it for the good parts and the useful references. I find this easiest to do, not with an audiobook or an ebook, but with the printed hardcopy version. Carr Article in The Atlantic: Is Google Making Us Stupid?